The Total Eclipse has been recognized as one of the hottest bands in the New York - New Jersey area. The Total Eclipse, a show band / dance band, consists of seven pieces that includes a dynamic lead vocalist, powerful horns and a hard driving rhythm section. Along with their smooth vocal harmonies and eye catching choreography, The Total Eclipse has the ability to make the audience feel like they are part of the show. They can supercharge most everyone. The Total Eclipse is a band for every occasion. They have performed at weddings, bar mitzvahs, corporate parties, clubs, concerts, etc. Anyone needing live entertainment, no job is too large or too small for them to perform. The Total Eclipse consists of Keith and Aubrey Maclin, who formed the band, on trumpet and saxophone. Tony Mahone is a well known long time member on the bass guitar. Ina Maclin, another long time member and the only female, plays the keyboards. Craig “C-Dreams” Redmond plays drums and sings vocal lead and background. Kelvin Robinson handles the lead vocalist role and new addition, Kevin “Ice” Robinson sings lead and plays lead guitar. 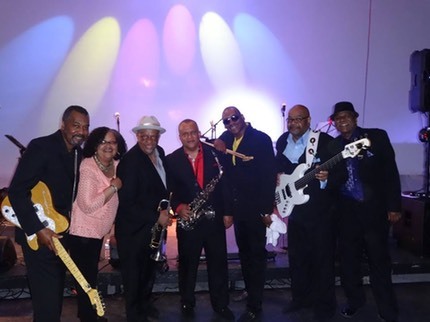 The Total Eclipse performs all time favorites by artists such as Earth, Wind & Fire, Stevie Wonder, James Brown, Kool & The Gang, Marvin Gaye, and the Commodores. They also play everything from smooth jazz, to Motown, to Caribbean, to Disco, to Pop and to R&B. They have proven to be a real crowd pleaser.